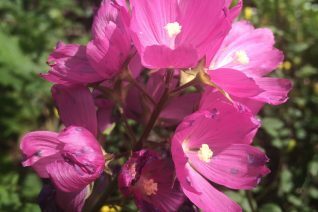 Oregon Checker Mallow is a fantastic long lived native perennial that thrives in gardens. 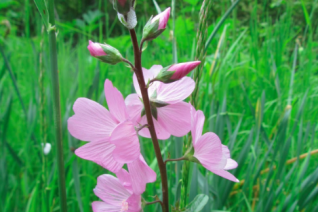 In May-July and sporadically later stems rise up from low foliage to 14″ and support many soft pink flowers. Loved by pollinators and very easy to grow. 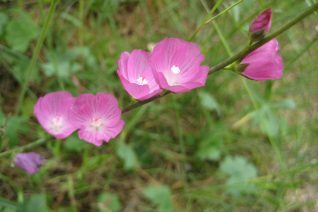 This perennial inhabits slopes around the Willamette Valley in very heavy clay soil that dries out to concrete in summer. Adaptable to richer conditions, it also encourages a longer bloom season. Full sun to part shade. Native in Oregon Oak woodlands with Oregon Iris, Shooting Stars (Primula hendersonii- formerly Dodecatheon). Pretty meadow flower that combines well with native grasses and the aforementioned perennials. Established plants can get by with very little water. Forms a spreading clump to 2′ wide. Winter deciduous. Oregon Native Plant.